The kentia palm is a low- to medium-light palm tree native to Australia which can grow up to 12 feet tall in a container. Kentia palms are grown indoors in any location and outdoors in warm climates only. Kentia is highly prized for its use as an interior decoration, particularly for low-light situations such as office buildings, small apartments and dorm rooms. It does require some regular care to thrive but will often tolerate mild neglect without too much complaint. Plant kentia palms in rich, porous potting soil in a large container with drainage holes in the bottom. Kentia palms need well-drained soil rich in organic matter. Place your kentia palm in an area which receives medium indirect sunlight. Full sun can burn the leaves of young plants, but they will grow in low light, albeit more slowly. Keep the temperature around the kentia palm between 70 and 80 degrees Fahrenheit during the day and around 60 degrees Fahrenheit at night. Palm trees need warm temperature,s and the kentia will not tolerate anything lower than 60 degrees. Place a thermometer near the plant to monitor the temperature. Water kentia palm trees at least once per week during summer months to keep the soil slightly moist at all times. Water more sparingly in winter months, only when the top one to two inches of soil are dry to the touch. 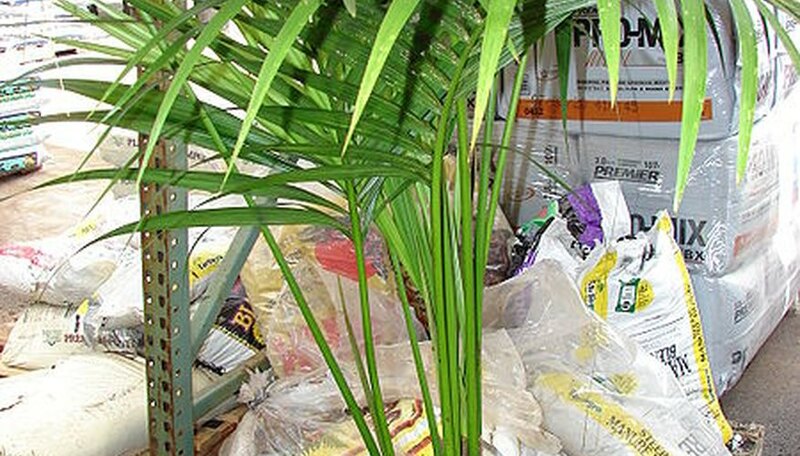 Fertilize your kentia palm once per year in the spring or summer using a slow-release houseplant fertilizer. Only fertilize while the plant is actively growing, and never during winter months. Refer to the manufacturer's instructions for proper dosage, and water thoroughly after application. Rinse the kentia palm once every two weeks to clean the leaves and remove any excess fertilizer from the soil. Spray using a fine stream of lukewarm water in the shower or outside during warmer temperatures. You may also set the plant outside during a rainstorm to achieve the same results. Replace old potting mix with fresh soil once per year in spring or summer to keep the kentia palm healthy. Move to a larger container at this time, if necessary. kentia palms are slow growing, and repotting is usually only required every two to three years if the roots have completely filled the pot. The kentia palm, like most other indoor palms, benefits from being placed outside in a shady, moist location during warmer months. However, remember never to place them in direct sunlight. Kentia palms can be grown outdoors in tropical climates. Care requirements for outdoor planting is the same, except mulching will be required to keep the soil cool and moist. Use a one- to two-inch layer of bark mulch for the best results.